- Premium Collection 2019 is the 1st V Series Special Series released in the Japanese and English format. - Focusing on the Premium Standard format with new G units for clans and nations, similar to Fighter’s Collection. - There will be 3 cards per pack; there will be 10 packs per box. - This set will only be sold in box and not in carton. - Includes support for the all 24 clans (excluding Touken Ranbu, Cray Elemental and Etranger). 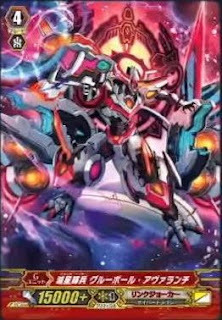 - There will be 6 Nation Stride unit, similar to Zeroth Dragon, and will be having the SGR/GR rarity! [Stride]-Stride Step-COST[Discard a card with the same name as a card on your [V]], [Stride] this card on your [V] from face down. CONT [G zone]: This card cannot be turned face up by abilities. 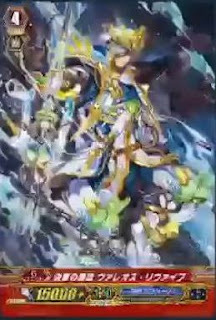 If this card is face up, you can [Stride] without paying the [Stride] cost. AUTO [V]: When placed, COST[C-Blast (1) & S-Blast (1)], call as many cards from your hand to all [R] as possible, and draw three cards. 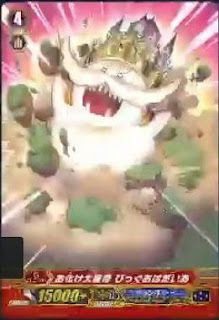 AUTO [V]: When placed, COST[C-Blast (2) & S-Blast (1)], and until end of turn, this unit battles all of your opponent's units in one attack, and gets [Power] +10000 and "AUTO [V]: When its attack hits, [C-Charge (1)].". 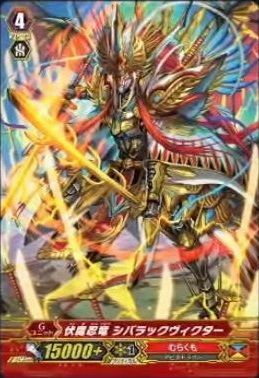 [Stride]-Stride Step-COST[Choose one or more cards with the sum of their grades being 3 or greater from your hand, and discard them], [Stride] this card on your [V] from face down. AUTO [V]: When it attacks a vanguard while boosted, COST[C-Blast (1) & turn a card in G zone face up], search your deck for up to two grade 2 cards, call them to [R], and shuffle your deck. AUTO [V]: When your rear-guard is placed from deck, that unit gets [Power] +5000 until end of turn for each face up card in your G zone. 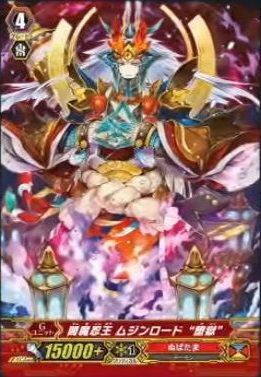 ACT [V] [1/Turn]: COST[C-Blast (3) & turn a card in your G zone face up], discard two cards from your hand, and heal two cards from your damage zone. 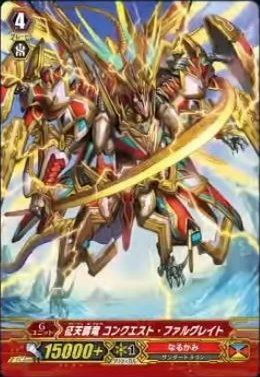 ACT [V] [1/Turn]: COST[C-Blast (1) & turn a card in G zone face up & retire two of your rear-guards], draw two cards, and until end of turn, all of your trigger units in the drop zone are regarded as being grade 1. 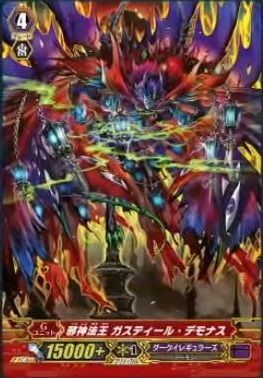 CONT [V] Ritual 10: All of your front row units gets [Power] +15000 / [Critical] +1, and when your opponent would call a card from hand to [G], he or she must call two or more at the same time. 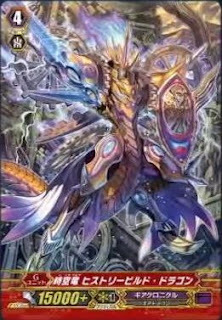 ACT [G zone] Unite: If your vanguard is grade 3, COST[C-Blast (2) & discard a card from your hand], and [Stride] this card on your [V] from face down. ACT [V] [1/Turn]: COST[S-Blast (1) & turn a card from your G zone face up], look at five cards from the top of your deck, call two cards from among them to [R], and shuffle your deck. 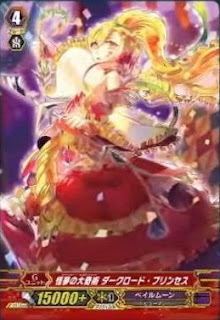 ACT [V] [1/Turn]: COST[C-Blast (1) & turn a card from your G zone face up], until end of turn, one of your rear-guards gets [Power] +10000 / [Critical] +1. If your soul has four or less cards, draw two cards, and [S-Charge (5)]. 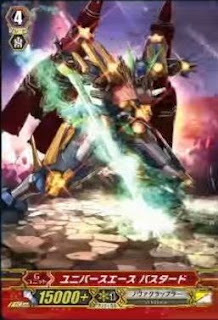 AUTO [V]: At the end of the battle it attacked, COST[S-Blast (15)], [Stand] one of your rear-guards, and until end of turn, your opponent cannot call sentinels from hand. AUTO [V]: When placed, COST[C-Blast (1) & turn a card from your G zone face up], choose one of your opponent's rear-guards, retire it, and this unit gets [Power] +15000 until end of turn for each sentinel in your drop zone. AUTO [V] [1/Turn]: When your opponent's sentinel or [G guardian] is placed, you may play "[Stand] this blazing unit, and it gets drive -1 until end of turn.". AUTO [V]: When it attacks, COST[turn a card in your G zone face up & put all of your [Rest] rear-guards into your soul], reveal seven cards from the top of your deck, call cards to [R] from among them in descending [Power] order up to the number of face up cards in your G zone, shuffle your deck, and if you put four or more units into your soul for the cost, all of your units get [Power] +10000 / [Critical] +1 until end of turn. CONT [V]: If you have six or more units in ♪♪ (Harmony), this unit gets [Critical] +1 for each face up card in your G zone. 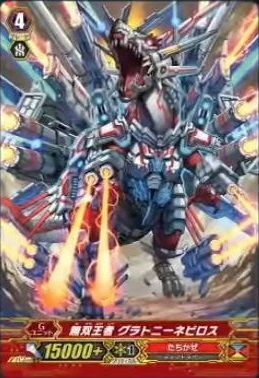 AUTO [V]: When it attacks, COST[C-Blast (1) & turn a card in G zone face up], look at ten cards from the top of your deck, call up to the same number of cards from among them as your units in harmony to [R], and shuffle your deck. 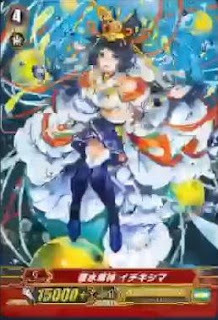 AUTO [V]: When placed, COST[turn a card in your G zone face up], call plant tokens to [R] up to the same amount of face up cards in your G zone, and this unit gets "CONT [V]: All of your plant tokens get [Power] +10000." until end of turn. 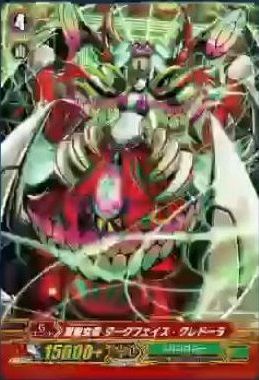 AUTO [V]: When it attacks, search your deck for cards up to the number of your plant tokens, call them to [R], and shuffle your deck.